Adelaide South Australia - In the City you will find great chances for shopping, excellent restaurants. elegant parks and attractions for visitors and travellers of all ages Adelaide Australia. 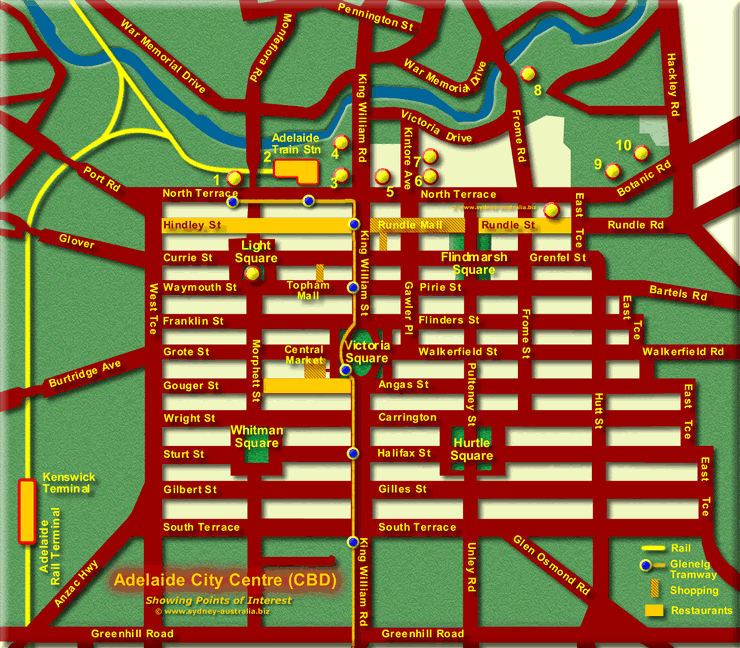 City Tourist Places to Visit - Map of the Inner City of Adelaide (CBD). Main Adelaide Shopping Areas, including Rundle Mall, Central Market and Topham Mall. 3 Note: At the completely refurbished Adelaide Train Station you will find the Adelaide Casino, the Hyatt Hotel, the South Australian Theatre Museum and the Adelaide Convention Centre. See the SA Map - South Australia Map. For Hotels and other accommodation throughout Australia, see Hotels in Australia.